The evolution of my life has paved the way for "Man Cave". I have always considered myself a decent artist, but have been told by my better half that my decorating tastes are questionable. Excepting the fact that I am male and have a few "questionable" items that I love, she's given me permission to show off my treasures in a designated area, my Man Cave. Valuables abound there, such as a legendary jackalope, spots memorabilia and a talking fish. 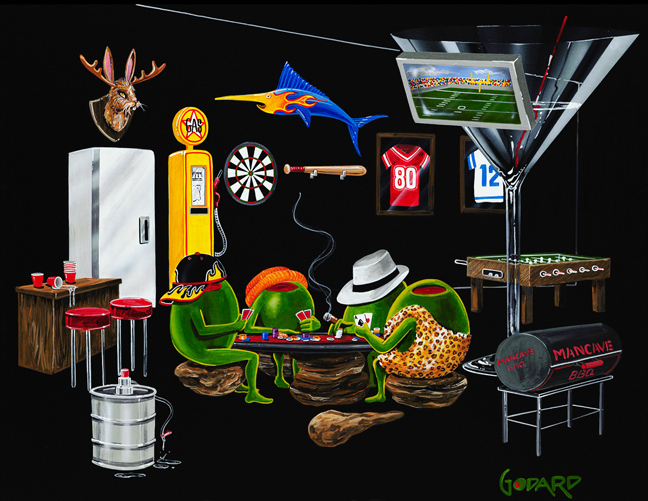 In the image, "the boys" are hanging out playing poker and doing the guy thing. Can you tell which poker player is the man of the house?